FYI, if you’re travelling Highway #7 between Chilliwack and Agassiz , you’ve got a new way to get a sneak peak at weather conditions or traffic concerns. 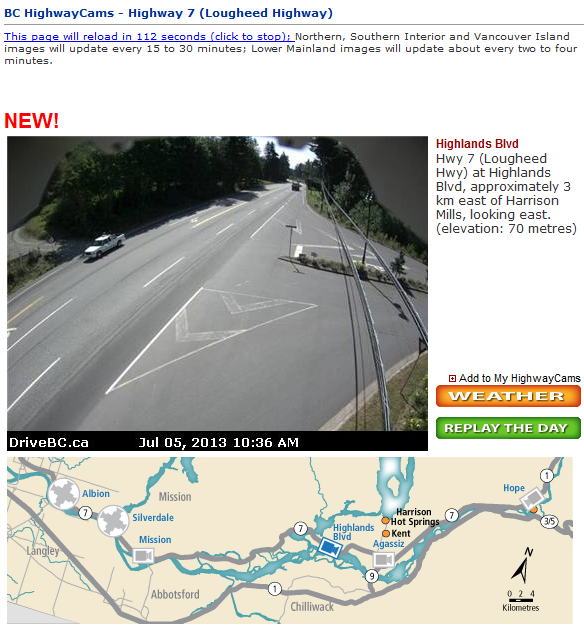 We’ve added a new Lougheed Highway webcam at Highlands Boulevard, about three kilometres east of Harrison Mills. At an elevation of 70 metres, this cam will give you a view looking east. Whether you’re a local or from out of town, you can find it on the DriveBC website. There’s lots of other features you might find useful as well, including Replay the Day (a snap shot of the previous 24 hours) or create your own collection of webcams with the My HighwayCams tool. Drive safely and have a great weekend.